Across a Star-Swept Sea is set in the same world as For Darkness Shows the Stars. If you remember my review of that book, you’ll remember that I really enjoyed the world Diana created. Persuasion is one of my all time favorite books and I really enjoyed the retelling, set in this future society. When I found out there is a companion novel, I was very excited. Not sure what to expect from The Scarlet Pimpernel retelling, I have to be honest and admit I really enjoyed it. Persis is a rich spoiled girl, living life to the fullest away from the apprising on the island of Galetea. What the rest of the world doesn’t know is that Persis is actually the infamous Wild Poppy, rebel and spy. Along with a group of trusted confidants, she battles the injustices that are brought on by those in power. When a handsome Galatean medic comes to her rescue on a mission gone not as well as she planned it, her world changes. Now, they are to play a loving couple in the eyes of everyone and Persis finds out that saving innocents is not the hardest job she could have. Keeping herself from really falling for Justen is. Persis is an interesting character. I loved seeing the two sides of her, the rebel and the spoiled brat, battling each other. She is a brilliant girl who has to hide that aspect of her at every turn. I liked seeing the kind of a person she was with her friends and family. She had the smarts and the confidence to pull of being Wild Poppy, but she also had the compassion that set her apart from others. Sure, at times, I wanted to scream at her, but that was mostly when it came to Justen. Now, Justen. Oh, Justen. He has just as many secrets as Persis, and he carries them close to his heart. I like that Justen has a conscience, that he wants to do something to right the wrongs of the society. He has a good heart and the love for his sister is adorable. It’s fun seeing Persis and Justen together. She tries so hard to keep up her charade, yet he ends up seeing through it anyway. On the other hand, she has to forgive him for many things. I think that’s what I like best about their relationship. It’s not all beds of roses, they really have to work at it. The world Diana created is powerful and unique. The characters that live in this world are fresh and intriguing. The combination of the two makes for an interesting tale. I really enjoyed how the first book tied in to the second, and it was nice seeing the characters from the other book. 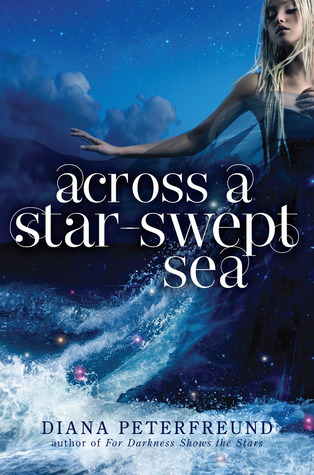 If you enjoyed book one, I highly recommend Across a Star-Swept Sea. The book hits shelves on October 15th, 2013. I’d love to hear your thoughts.